Back in 2014 when CHIKARA was in the midst of a year long shut down at the hands of the Titor Conglomerate, the promotion was put up for sale. It was at that time that art collector and fomer CHIKARA competitor Robbie Ellis purchased the promotion and brought it back to the Chikarmy! While Ellis has handed over the day to day operations to Director of Fun, Mike Quackenbush, he remains the promotion’s owner to this day. The story of Robbie Ellis is a unique one, as detailed in the movie Canvasman: The Robbie Ellis Story. 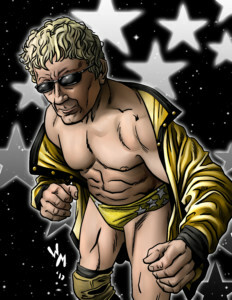 He lived a double life, as both a renowned art dealer and a professional wrestler, which he did well into his 60’s. In CHIKARA he often teamed with the immortal Larry Sweeney. Perhaps these two can team once again in your fed! We are proud to include Robbie Ellis, along with Solo Darling, Travis Huckabee, Darkness Crabtree, Private Eye and Crummels and Defarge, along with one more wrestler from CHIKARA’s past in this unique 8-pack that showcases the great past and awesome future of CHIKARA. The CHIKARA Aniversario pack will begin mailing everywhere on May 31st, and is available to preorder right now!